you can find here your perfect stay, close to the wonderful chaos of the metropolis. - The strategic location. 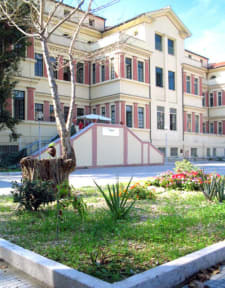 Litus is located just in front of Mediterranean Sea, in a historical monumental building, property of the Common of Rome. 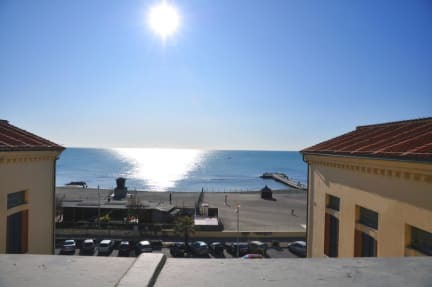 It's reachable with public transport in 25 minutes from the city center, 10 minutes from the excavations of Ostia Antica and only 15 minutes from the international airport of Fiumicino. - The best price-quality ratio. Litus has over 120 beds in clean and spacious rooms with their own bathrooms , TV, sea views and low beds (no bunk beds!). We offer buffet breakfast included in the price with hot and cold drinks, a great variety of cakes, cereals ,, toasted bread, butter and marmalades. with free movies on demand, free parking,no curfew, no lock-out,24h reception,entertainment room and discounted beach access. - We are always ready to help you in any needs or request and make your stay with us a moment of friendly and human contact. - Please print out your confirmation and pay the balance due upon arrival. - If you do not give us 48 hours notice (2 days) of your 'no show' by e-mail or fax , we will unfortunately have to debit your card. The amount charged will be your first night's accommodation. Great hostel if you are looking for the sea, a bit outside Roma and close to the airport. The staff is really friendly, and the night you can listen to the music coming from the beach, but it doesn't prevent you from sleeping. The dorms are clean but easily dirty due to the nearby beach. The decoration is nice and there is lots of space!! A 2 pas du front de mer, dispose d'un grand parc de stationnement, des restaurants aux alentours, mais surtout, proche de l'aéroport de Fiumincino, donc pratique quand l'on arrive en Italie en fin de journée. Sinon, gros bâtiment pas très convivial. Bien pour visiter le site d'Ostia antica, il faut prendre un train ou un bus pour aller à ostia antica mais c'est plus proche quand même que depuis Rome centre. L'auberge est juste en face de la mer donc sympa le soir pour se détendre. Le petit déj inclus est très pratique ! Donc très bon rapport qualité-prix.